The second volume of the Eisenhorn Trilogy picks up the story a century on from the events of Xenos, with Eisenhorn and his allies (some old friends and new faces) plunged into a new investigation. As with almost all procedurals, there is a point where the detective is implicated in wrongdoing and has to go on the run to prove his innocence, which is the point Eisenhorn reaches in this book. Mildly cliched, but Abnett handles this storyline with aplomb, with logical use made of Eisenhorn's allies and resources. 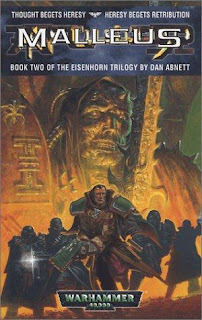 The story also pushes Eisenhorn a little bit more towards the dark side as he has to become more ruthless to defeat his enemies, which also risks cliche until Abnett throws a couple of clever curve-balls towards the reader in the closing chapters (the motivations of the antagonist are well-thought-out, making good use of the Warhammer 40,000 universe though, once again, foreknowledge of the setting is not required to enjoy this trilogy). Malleus (****) is a well-written sequel to Xenos and continues the triloy in fine form. The book is available as part of the Eisenhorn omnibus now in the UK and USA.